Claims that pesticide use in the UK is reducing are often put forward by those in the pro-pesticide camp in order to argue that there is no need for stricter regulation. But does this claim really hold up under close scrutiny? The claims made about pesticide use halving since 1990 are based solely on the weight of pesticides being used – and in that sense they are correct. 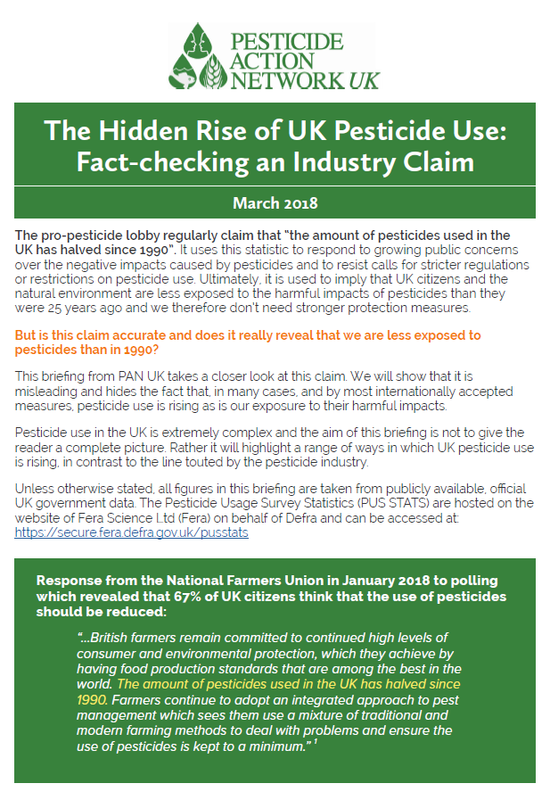 However, PAN UK has analysed the official UK data on pesticide use and we have found that, in many cases, and by most internationally accepted measures, pesticide use is rising as is our exposure to their harmful impacts. The toxicity of pesticides has increased over time so that less chemical is required to do the same job. As an example some neonicotinoid insecticides are 10,000 times more toxic than the most notorious insecticide in history, DDT. The area of land being treated with pesticides has risen. The number of times crops are treated with pesticides has gone up. The variety of pesticides being used on particular crops has increased. 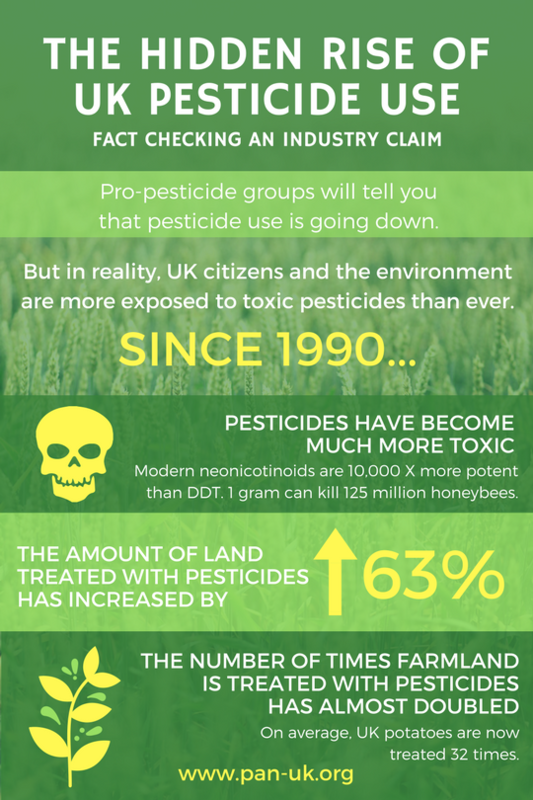 And all the while pesticides are having serious harmful effects on our environment – farmland bird species continue to decline, bees and pollinators are being poisoned, our water is being contaminated and pesticide residues are present in the food we eat. Weight is a meaningless metric for measuring the use of pesticides as our research clearly shows. PAN UK is calling for a more robust system of monitoring pesticide use coupled with a quantitative target for the reduction of pesticide use throughout the UK. The table below highlights just some of our findings and the full briefing can be downloaded here.